Farmers serve on 'think tank" for bank and help determine its strategy. Nate Franzen, Agri-Business Division manager at First Dakota National Bank, announces the following appointments to the First Dakota Ag Advisory Board: Jim Aden, Gothenburg, Neb; Jim Woster, Sioux Falls, S.D. ; Todd Bushong, Tulare, S.D. ; Dan Eisenbraun, Yankton, S.D. ; Pam Geppert, Kimball, S.D. ; Steve Eichacker, Salem, S.D. ; Terri Funk, Neligh, Neb; Chad Heckathorn, Elk Point, S.D. ; Larry Klumb, Ethan, S.D. ; David Gillen, White Lake, S.D. ; and Cody Jorgensen, Ideal, S.D. ; and Bill Even, Humboldt, S.D. Farmers serve on ‘think tank” for bank and help determine its strategy. The Ag Advisory Board also consists of two ex-officio members: Barry Dunn, dean of the College of Agriculture and Biological Sciences at South Dakota State University, and Craig Schaunaman, state executive director of Farm Service Agency in South Dakota. First Dakota is a leader in the ag finance industry and is currently ranked as the 3rd largest community ag bank with the largest farm loan portfolios in the United States. 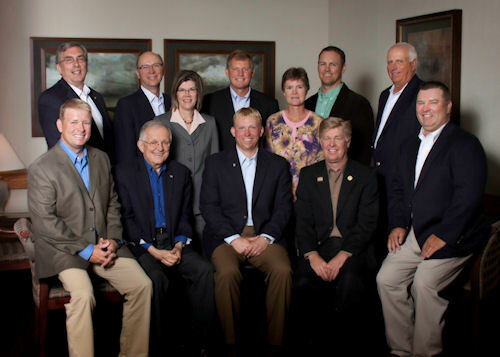 One of the primary goals of the Ag Advisory Board is to serve as ambassadors in the marketplace. It also serves as a think tank, focusing on facing various ag industries, and assists First Dakota in determining strategic direction for the Agri-Business Division. The Ag Advisory Board consists of 12 regular members including nine agricultural producers and three agri-business persons. The board also has two ex-officio members who are selected from state government, the Farm Service Agency, or an area land grant university. First Dakota was founded in 1872 and holds the first bank charter issued in all of Dakota Territory. It has 14 full-service banking locations in 10 South Dakota cities. It also has six loan production offices throughout South Dakota and Nebraska.